The initial 'U' at the start of Luke chapter 24 is in the form of a frontal creature or human with big staring eyes. The figure with its stylised face and body resembles others in contemporary manuscripts associated with Scotland and Ireland, such as the Book of Deer (now in Cambridge University Library). 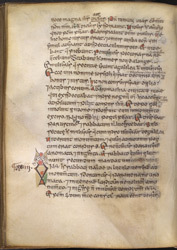 Running diagonally across the page from upper left to lower right is a line which marks where one piece of parchment has been stuck to another, to compensate for the uneven edge of the smaller piece.